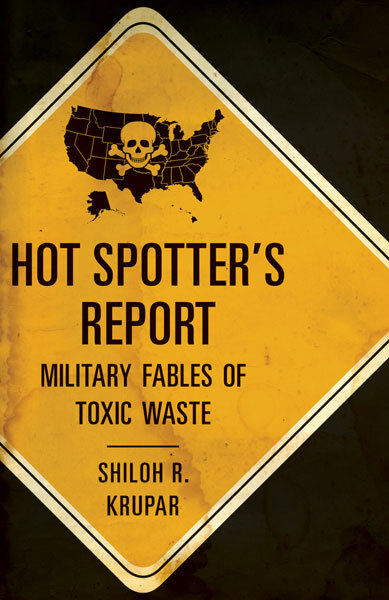 Shiloh R. Krupar’s new book, Hot Spotter’s Report: Military Fables of Toxic Waste, with University of Minnesota Press, was released this summer. It is about the remaking of the world via the externalities–or wastes–of war, from residues from the production of chemical weapons to nuclear radiation. It is another take on the growing literature about the role of waste in the anthropocene and a ubiquitously, though unevenly, polluted world. Many nuclear and other U.S. military facilities from World War II and the Cold War are now being closed and remediated. Some of these sites have even been transformed into nature refuges and hailed as models of environmental stewardship. Yet, as Shiloh R. Krupar argues, these efforts are too often doing less to solve the environmental and health problems caused by military industrialism than they are acting to obscure the reality of ongoing contamination, occupational illnesses, and general conditions of exposure. Using an unusual combination of empirical research, creative nonfiction, and fictional satire, Hot Spotter’s Report examines how the biopolitics of war promotes the idea of a postmilitary and postnuclear world, naturalizing toxicity and limiting human relations with the past and the land. The book’s case studies include the conversion of the Rocky Mountain Arsenal into a wildlife refuge, a project that draws on a green “creation story” to sanitize other histories of the site; the cleanup and management of the former plutonium factory Rocky Flats, where the supposed transfiguration of waste into wilderness allows the government to reduce the area it must manage; and a federal law intended to compensate ill nuclear bomb workers that has sometimes done more to benefit former weapons complexes. Detecting and exposing such “hot spots” of contamination, in part by satirizing government reports, Hot Spotter’s Report seeks to cultivate irreverence, controversy, coalitional possibility, and ethical responses. The result is a darkly humorous but serious and powerful challenge to the biopolitics of war. See the author’s blog post about the book. One chapter, “Where eagles dare: an ethno-fable with personal landfill” is also an open access article. This entry was posted in Environment, Government, history, Nuclear and tagged Military Fables, Shiloh R. Krupar, Toxic Waste, University of Minnesota Press. Bookmark the permalink.